When my hubby asked me the other day what I think about earrings as a Mother’s Day gift I immediately asked back: for your mom or mine? Only a few moments later did it occur to me that, for the first time ever, Mother’s Day is also about me. Already for nine weeks I’m a mom as well. Motherhood has its good days and exhausting days and I wouldn’t change it for the world. The way our Birdy arrived is a little untypical so for the first post in this blog hop I decided to tell the story of how she was born. Sometime around Christmas our little one decided that the best way is up, i.e., that she prefers lying in the womb with her head up. Imagine my surprise when on the first check-up in January my doc informed me that the baby has made a flip without me noticing so what I thought was boxing was actually kicks! The doc assured me that there’s still plenty of time for her to turn so I didn’t pay much attention to the whole matter. Yet as the weeks counted down and the little one showed no signs of wishing to flip again, I started to become a little worried. My midwife suggested spending some time on my elbows and knees to encourage her to turn. We happily introduced boardgames to our evening activities and it brought us and our friends lots of fun but lead to no other results. When the status quo was unchanged by week 36 I decided to get a consult about turning the baby from the outside and went to see a specialist at the local hospital that specializes in breech babies. Much to my disappointment, after a careful examination the doctor said he believes that a turn attempt would not be successful. He did offer to try nevertheless and sent me home with a folder full of informative material about turning babies and natural breech births. I dismissed the idea of attempting to turn Birdy quite quickly as I didn’t see the point of undergoing a somewhat painful and risky procedure if a guy who carries out 4-5 of those a day believes that it won’t work. Which left two options: planning a c-section or going for a breech birth. Me being me, I sat down to make a list of pros and cons while my hubby claimed it’s my decision and he’ll support either choice. Sweet but not overly helpful. 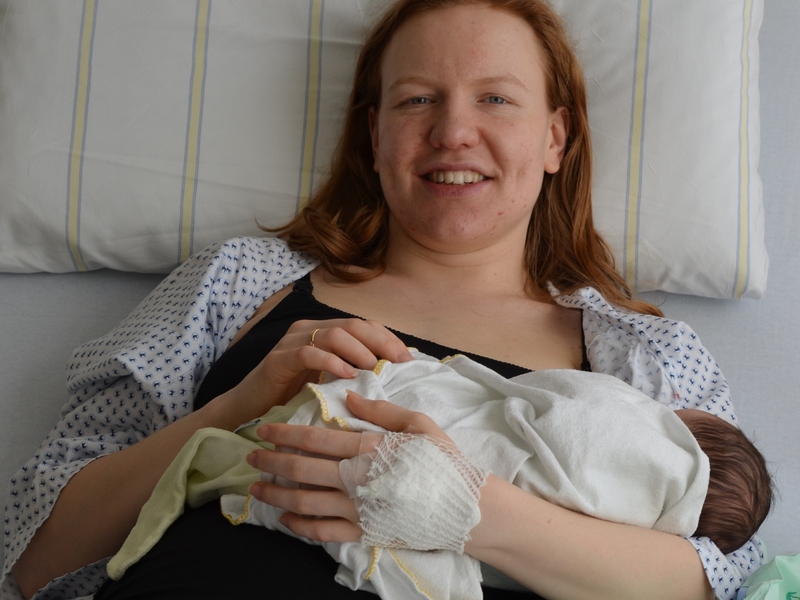 After almost two weeks of thinking and changing my mind three times a day, I decided for a c-section as it’s considered to be the safest option for the baby. So on week 38 we made our way to the hospital to make an appointment for the c-section. I must say that having the exclusive chance to choose our child’s birth date was a little uncanny. It’s the exact opposite of everything you usually associate with a birth: instead of waiting for contractions to begin (which can happen any time and anywhere) you can choose a time that suits you the best, do all the necessary preparations in peace and, in my husband’s case, give a heads-up to your boss that you need a free day. You get a baby without feeling a single contraction and the long painful hours in the delivery room are replaced by a 1h long surgery throughout which you are awake but not feeling any pain. n the words of my husband as we made our appointment for Monday morning: this feels like ordering a baby! After a lot of waiting and a few more check-ups I was shown into the surgery room and my husband joined me short afterwards. The doctors got to work and 10 short minutes later we heard a scream and were shown a screaming baby with a head full of dark hair. The little one was quickly cleaned, weighed and measured and then sent off with my husband for some cuddling time while the doctors sew me back up. Some 40 minutes later I could finally cuddle our little Birdy myself and let the fact that I’ve become a mom to a wonderful, helpless little being truly sink in. This if my first post in The Ultimate Guide to Baby’s First Year blog hop. Click on the image below or scroll to the bottom of this post to read the contributions of the other blogging moms who participate in this fun event! Congratulations on what sounds like your first Mother’s Day! I agree about the Mother’s Day mentality being an adjustment. 🙂 — but you will have even more fun as your baby becomes a toddler. We did a craft for each grandma for Mother’s Day and I loved seeing our son’s personality show through. We “ordered” our second baby, too. He was a planned C-section… unlike with the first. I’m so pleased to be a fellow mommy blogger and joining you this week in the Ultimate Baby Guide! Isn’t funny how in motherhood nothing seems to go as planned. We learn we are not in control any more. What a beautiful story. Thank you so much for joining in this series with me! Thank you for organizing it, Dayna! And isn’t it what they say about motherhood – it never goes as planned but is a wonderful journey nevertheless? Thanks for the story of your “ordered delivery”… I wish you a great week with your baby. I think you’re going to like my post for “celebrate childhood” (I will post videos of my children babbling), you will want to do the same!